A few weeks ago, my condo association organized a big yard sale. The board asked everyone for items to donate, and I decided to donate yarn. I don't have a lot of clothes or gadgets, but I do have plenty of yarn to spare. 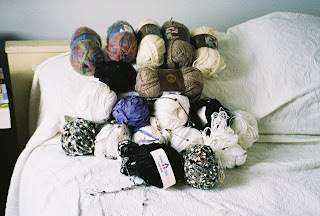 So I went through my stash and pulled out all the yarn shown below. Most of it is yarn I bought in bulk from Smiley's Yarns; I still like the yarn but just got sick of it after making several projects with it. Some of it is yarn I bought for a particular project that was just too ambitious. And some of it is yarn that is pretty in the skein but the devil to work with. In every case, I just had to admit to myself that I would NEVER use it and that it would be better to let someone else give it a try. No one bought my yarn at the yard sale. So it has been donated to a local church's charity knitting/crocheting program. I hope the good ladies at the church can make better use of it than I ever could.